This card is my official welcome to spring. Ah, here come birds, flowers, butterflies and bunnies! 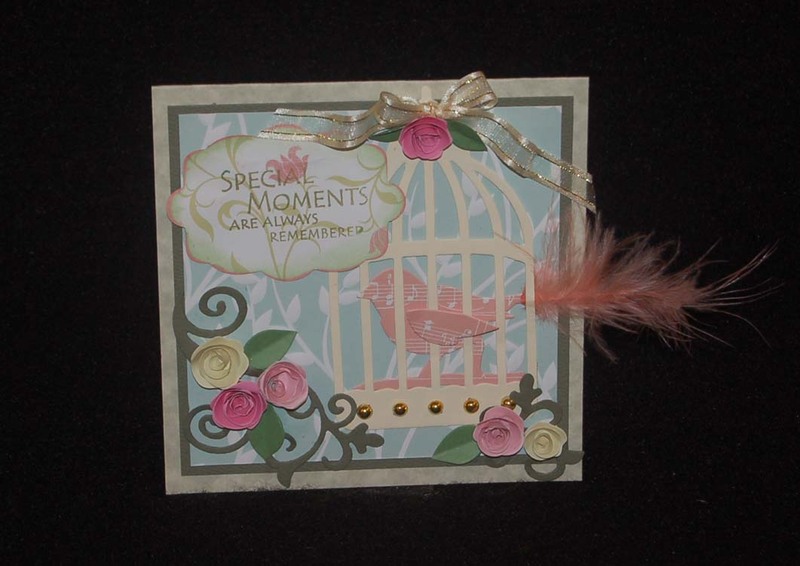 I'm happy that I finally used the Tim Holtz bird cage die that I purchased a few months ago. 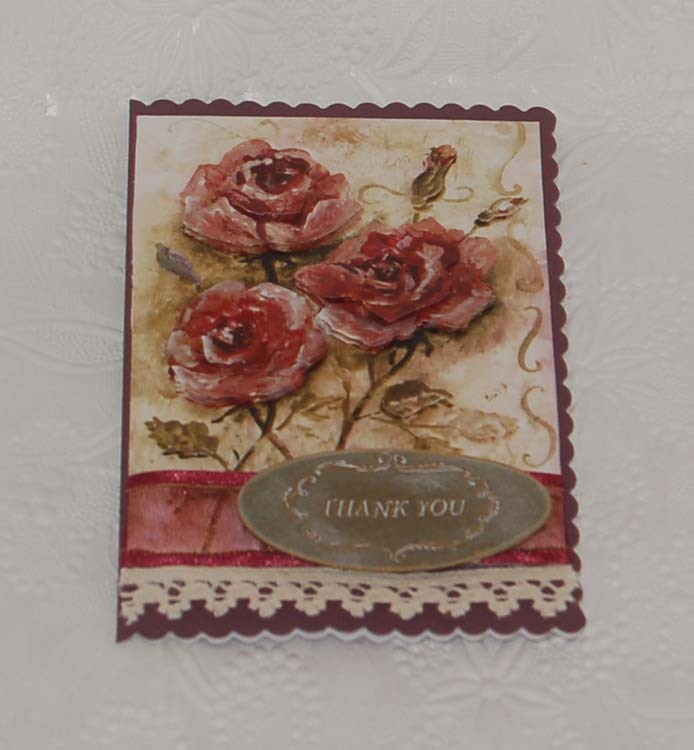 However, the main reason I made this card was to highlight the quilled paper roses. It is my hope to eventually teach a class or at least offer the pre-cut unquilled roses for sale. It is very easy and economical to make them. The die cut bird is also from the Tim Holtz die set and the scrolling greens plus worded label are Sizzix die cuts. The little gold dots and feather are from Ben Franklin Crafts. Oh, I almost forgot to tell you that the American Crafts printed papers I used (plus other selected ones) are now on sale (50% off I think) at BFC. I'll let you know if and when I set up a card class at Ben Franklin Crafts in Hilo. Thanks for stopping by to read my blog. I hope you've enjoyed this post. Please feel free to comment...I love knowing what's on your mind. When I first saw the packages of pillow boxes at Ben Franklin Crafts, I was very excited although I had no idea what I was going to do with them. Actually, I purchased them in February for Valentine's Day because there were pretty red ones which I bought along with gold and silver ones. Anyway, as I was moving craft supplies around I was struck by the color and sheen of the gold boxes because they reminded me of Godiva chocolate boxes. I decided to fashion treat boxes for Easter which would have a similar luxury look. I only folded the bottom of the boxes so that I could adhere the Sizzix die cut topper or rosette to the top (see previous posts to learn more about the dies). The stamped images were made using the Studio G $1.25 clear and rubber stamps. The Hello Kitty image was made using a die I purchased last year but may still be available. 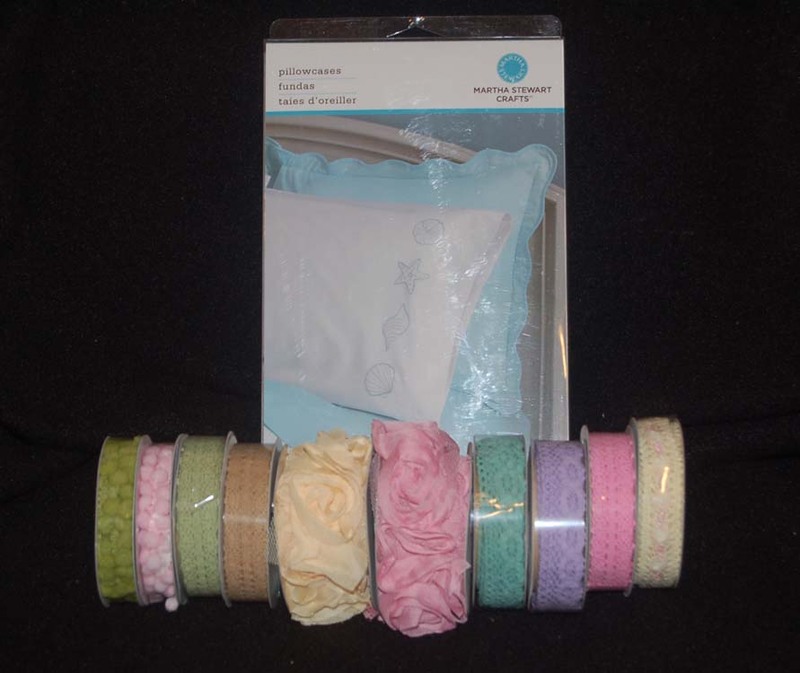 Also shown in the photo is a pack of 10 unfolded pillow boxes which were amazingly inexpensive. 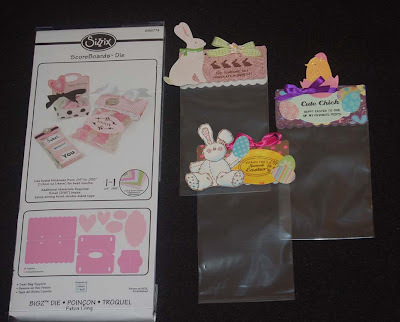 Buying the prefabricated boxes will save you time and let you do the fun part of embellishing. Also please notice that the two outer boxes (click on photo to enlarge) have flowers and leaves on the sides that were made with pipe cleaners (except for the small white Prima flower). The extra skinny pipe cleaners (so many yummy colors!) are also sold (probably near the pillow boxes) at BFC. The reason I fashioned the flowers on the side is because the die cut topper had holes on the sides for stringing ribbon (another design option). I used my slotted paper punch to cut holes in the sides of the box to match those on the toppers. Oh yes, the ribbons were from my stash of recycled pieces as well as new ones from American Crafts (green pom pom and beige crochet). 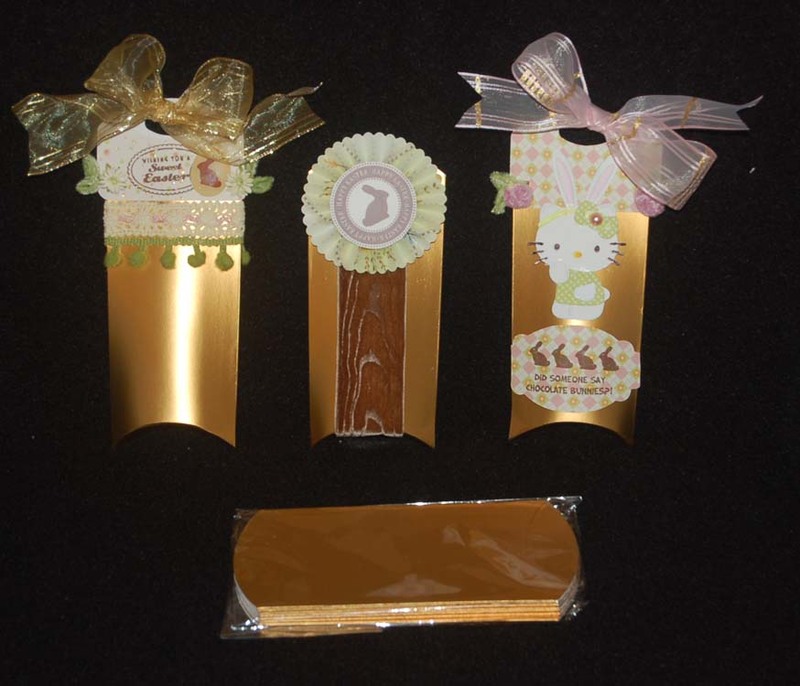 Even if you give only a single chocolate rabbit, presenting it in a special handmade box will tell the recipient he/she is special. Making things special is why we craft, right? At first when I purchased this Sizzix bag topper die, I thought that I would need special extra thick paper or cardstock because it was called a 'ScoreBoard' die. However, I discovered that regular cardstock worked very well and made quick work of multiple bag toppers. The size of the toppers made them perfect for using up my small scrap papers. I decorated these bag toppers with Studio G epoxy stickers ($1.25 at Ben Franklin Crafts) and Studio G rubber stamped words and images (also $1.25 at BFC). The sparkly bunny and chick are stickers from K and Co. and the large bunny image was made from an old rubber stamp design. Please click on the photo to see the details. Now the only thing left to do before Easter is find something to fill inside the bags. Maybe I'll opt not to do the usual candy stuff and give craft embellishments.......nah, better do both! Thanks for stopping by and I hope I've given you some free ideas to make your Easter special. Who says your jewelry has to be made of silver or gold and cost a fortune? 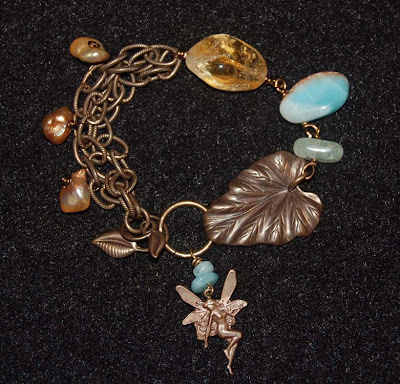 I think this antiqued brass bracelet made with Vintaj findings looks every bit as rich as one made from pricier metals. The secret for achieving this look is picking a few special gemstones (no two are alike) and using the machine-made findings in unique ways to give them a handmade feel. For example, the large Vintaj leaf was turned into the clasp by curling the tip around a large jump ring and the hook was made by spiraling a two leaf brass piece. As is usually the case, the pearls had very small holes, too small to fit a head pin through, so I curled the end of a thin copper wire to form a head and used that for a customized head pin. This handmade head pin adds to the overall artistic vintage feel of the piece. Even if you are a novice jewelry maker, you can make a similar 'enchanted' bracelet with just a few basic tools, Vintaj findings, and a handful of gemstones. 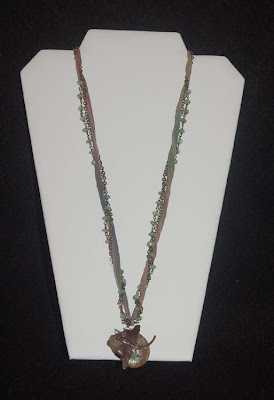 Thank you for reading my blog and I hope I have inspired you to give jewelry making a try. I'm sure you'll be surprised at how easy it is to make something you'll be proud to wear. We all love embellishments for paper crafting and we all need to use up our stash of paper scraps. The new Tim Holtz die (in the photo) will help you satisfy both of those needs. This die easily turns 12" strips of scrap paper into pre-scored pieces that are easily folded, taped, and then flattened into rosettes. 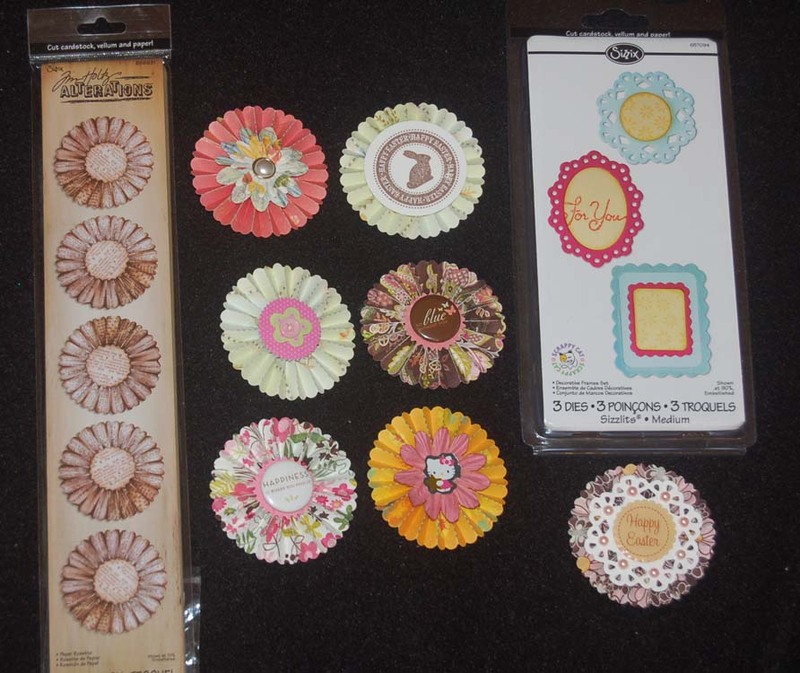 To further decorate these rosette embellishments, stickers (like the button ones from American Crafts or Easter ones from Studio G) or Prima flowers and brads can be added. The Sizzlet three die set in the photo was used to make the doily decoration for the rosette beneath the die. Like eating chips, making these rosettes is addictive; but it's a fun way to use up all those pretty scraps. Packaged attractively, they would make a sure-to-please gift for a crafter friend or a guaranteed-to-sell craft fair item. Thank you for being a reader of my blog. I hope that you found this information valuable. Please visit again soon for more ideas. It would make my day if you left a comment. I appreciate all of your feedback. When my oldest son was little, we visited lots of science museums because he was interested in dinosaurs. I always made it a point to stop and shop at the museum gift shops for souvenirs. After awhile I had quite a collection of fossils and today I still like looking at them. This fossil ammonite necklace is my attempt to showcase the beauty of an ancient sea creature. To me, the crusty irridescent surface of the ammonite pairs well with the antique look of the Vintaj brass dragonfly finding. It was easy to mold the metal around the fossil by using a bail pliers. I added jewelry cement to secure the fossil in place. The bottom photo shows how the necklace looks with the strands separated. 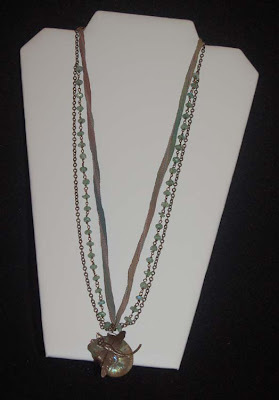 I think that the brass chain and silk ribbon match nicely with the handmade gemstone chain. Yes, each link of the chain was handformed and includes a semi-precious bead. Although the chain did take a long time to complete, I do think it was worth the effort. It is so rewarding to be able to incorporate some sweet family memories into my handcrafted jewelry. Create a wearable memory and tell someone its story. Thanks for visiting and I hope you have an outstanding week! I was worried that Easter would be in March this year and I would again be rushing to create Easter crafts. Thank goodness this year Easter will be in late April so we all still have time to do some sweet, cute, and fuzzy crafting. Don't you just love bunnies (especially the chocolate ones) and chicks? 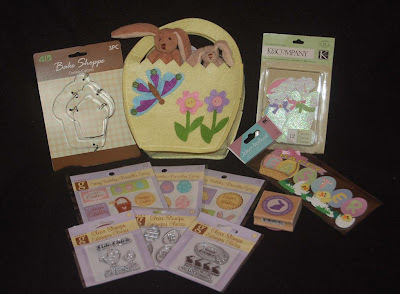 Pictured here are just a sampling of the Easter items available now at Ben Franklin Crafts. Aren't the Sierra Pacific felt basket and Nicole Crafts plush mini bunnies just so adorable?......and they are inexpensive too! Although there were lots of Easter cookie cutters on display at Ben Franklin Crafts, I chose the cupcake cookie cutters because they were a shape I've never seen before.....best of all they were a set of 3 for only $2.99! Unfortunately, the K and Co. and Jolee stickers didn't photograph well; but believe me, they are really adorable. As always the selection of Easter stickers is fabulous and cute, cute, cute. 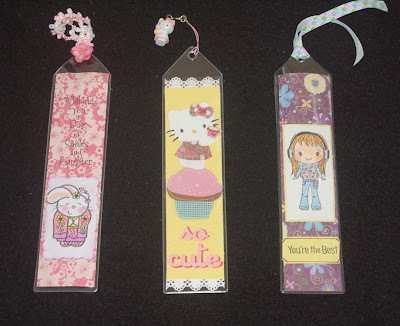 Finally, the rubber stamp, clear stamps, and epoxy stickers in the foreground of the photo are by Studio G. If you are a regular shopper, you know that they are a bargain at $1.25 and often go on sale for $1! Even though there are several weeks before Easter, I hope that you won't miss out on all the Easter goodies because the cute stuff sells out quickly. Hop down (maybe a car would be faster) to your nearest Ben Franklin Crafts today and start your Easter crafting. 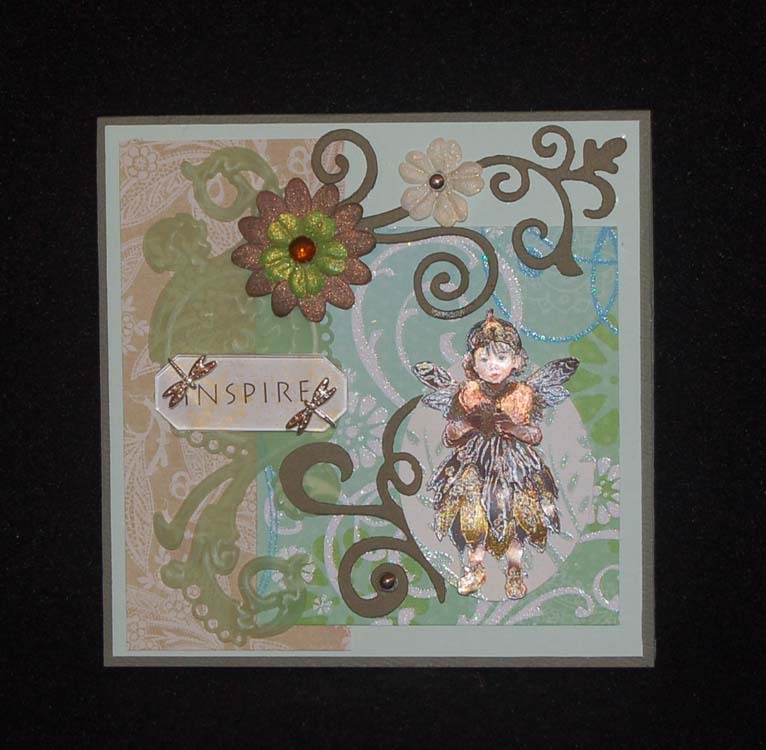 Here's another card I made using a die cut layer fairy that I got from the CHA show. As with the layered roses the fairy was put together with tiny foam squares. On each sheet of die cuts there are about three different figures. Some of the die cuts are printed semi-glossy and others like this fairy are printed metallic foil paper. I think that Ben Franklin Crafts should start carrying these die cut sheets because there are so many themes (bears, geisha girls, flowers, etc.) that would appeal to paper crafters. Anyone else interested in this technique? The swirly light green vellum on this card was cut using a die embosser from the same company that sells the die cut themed sheets. The other dark green swirls were cut using a Sizzlet set. I spritzed the paper flowers with Tsukineko sparkle spray to help them match more with the card. This is a good way to fancy up your boring single color paper flowers.....you know that you have a lots of them that could use an updated look. 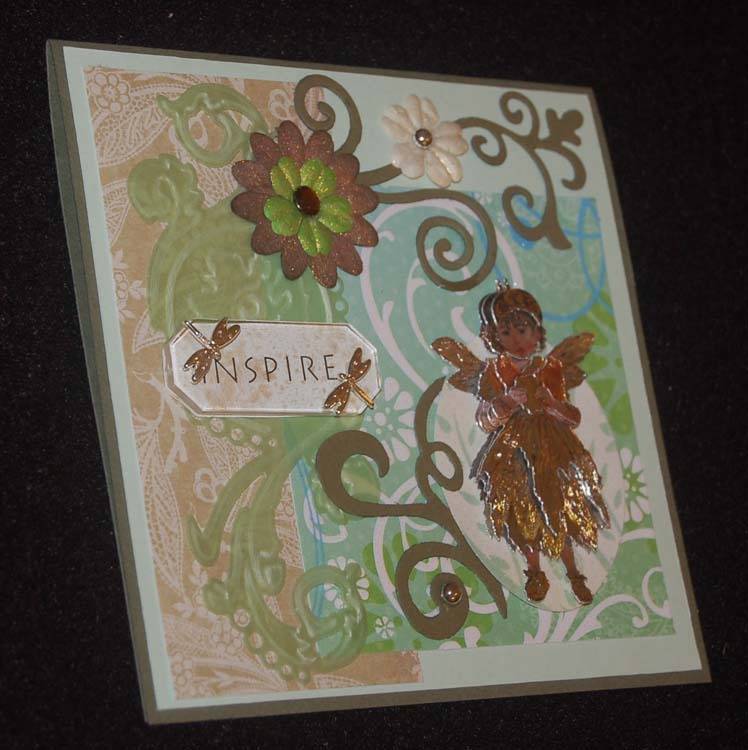 The 'inspire' plaque is from my stash and I spritzed the inside paper with gold so that it wouldn't be so plain white. Oh, the dragonfly brads were found in the bottom of my embellishment drawer.....I knew that I was saving them for something! This second photo is a side view to show you the layers of the fairy. Sorry, the shine sort of makes it hard to see the layers. Anyway, I had fun making this card because I didn't have a deadline and used shiny things plus the colors I love. Have a good week and thanks for stopping by. I love your comments because they give me feedback that helps me to grow as a crafter. Thanks friends! P.S. Don't forget to use your 40% off coupon at Ben Franklin Crafts this weekend! I absolutely fell in love when I saw the new American Crafts ribbons at Ben Franklin Crafts. The luscious colors just shout, "SPRING" and the price ($2.99) says, "bargain"! My favorites are the rose ones in the center and the pom-pom ribbons on the left. Of course the crochet-look ribbons are fabulous too and so popular with cardmakers. In the back of the ribbon rolls is one of the new Martha Stewart embroidery crafts I discovered at Ben Franklin Crafts. This package contains two pillowcases that have a seashell border printed on them and includes the thread and instructions. There are lots of pillowcase designs to choose from (roses, butterflies, etc.) 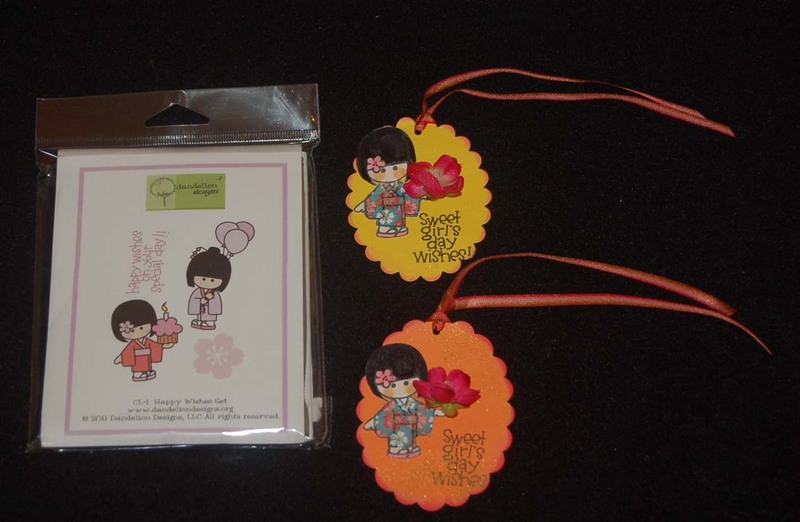 as well as embroidery kits for baby onesies, bibs, and aprons. I think these kits are fabulous for the novice embroiderer especially since they have the designs printed on the finished item so it will be easy to create a lovely project in an evening. Spring is the perfect time to learn a new craft or revisit an old one. Try embroidery....it is very satisfying to know that your work will probably outlive you and be enjoyed for generations to come. Thank you for reading this blog. Come back again soon. I was playing with some of the samples I got from the Craft and Hobby Association (CHA) show and started with these simple 3-D layered roses (hard to see the layers in the photo, sorry). I wasn't too thrilled about the painterly appearance of the roses ( I like more realistic flowers.) but I did like the process of making the layers using foam between the die cut pieces.....so easy. 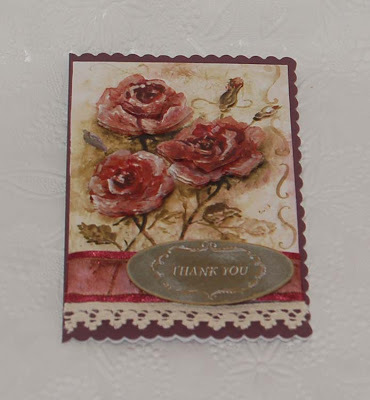 Anyway, I needed a thank you card so I decided to incorporate this 3-D rose panel. I began by making a label and using rub-ons for the words. As sometimes happens, not all of the letters rubbed on perfectly. Since the roses sort of had the shabby chic look I tried rubbing on another set of letters (this time gold) over the white. By smudging white and gold ink around the words and on the edge of the label, I think the label really works well with the total shabby chic look of the card. I am telling you all this because I want you to know that sometimes it is possible to turn lemons into lemonade. (The label was made with a Sizzix die, the crocheted ribbon is from Hero Arts, and the card base is from a Studio G pack....$1.25 for a set of 6 envelopes and scalloped cards.) Thank you for being a visitor to this site. All of your comments are greatly appreciated and encourage me to do what I love....CRAFT! Did you know that Ben Franklin Crafts sells Hello Kitty cake decorations? I found these hard candy Hello Kitty heads at the Mapunapuna store. My carrot cake cupcakes turned out tasty but the frosting was a bit too soft because I used low fat cream cheese instead of the regular kind. Now it looks like Hello Kitty is melting. LOL! 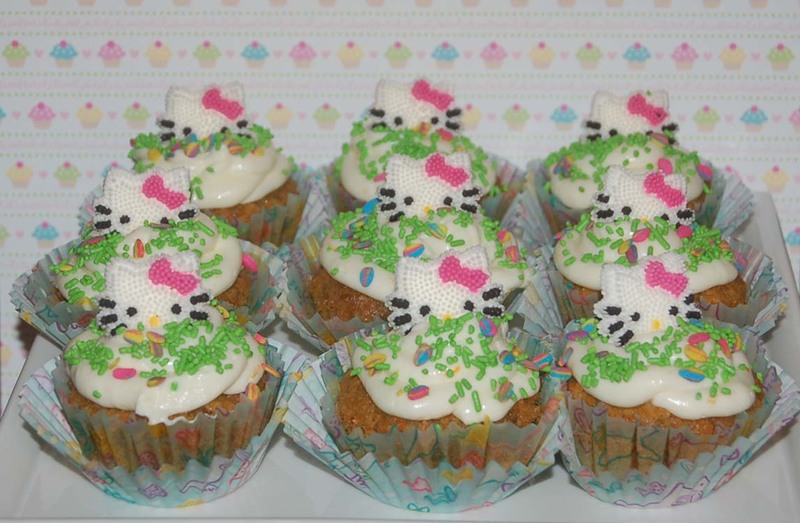 To add some more color to the cupcakes, I sprinkled on Wilton Easter candy decor sprinkles. It's easy to make cupcakes and so inexpensive if you bake them yourself. Someome deserves a cupcake today..... don't forget to sprinkle it with love! Just a short post today to wish everyone Happy Girl's Day! I bought the Dandelion Design rubber stamp set to make Girl's Day tags or cards but then I noticed that although the designs were Japanese dolls, the set was actually intended for birthday greetings. I improvised by using last year's Girl's Day word stamp and attaching a cherry blossom where the cupcake was in the doll's hand. Anyway, I just thought that this was a good tip to pass on....try to think of more than one use for your rubber stamps to get more for your money. Oh, another tip: Buy your uncut Dandelion Design rubber stamp sets from Ben Franklin Crafts. You don't really need to cut them apart because you can ink up just the images you want to print. For an add bonus, each of the new Dandelion Design sets come with a template and instructions to make a very unique paper construction. 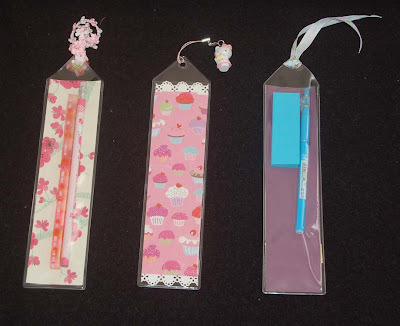 Anyway, gotta go and attach the tags to gift bags for my favorite girls. Happy Girl's Day!